Welcome to part five of our eight-part Guide to Guerrilla Marketing. So far, the guerrilla marketing efforts we’ve explored in parts one, two, three, and four have been all about the Benjamins. Companies small to massive have used guerrilla techniques to grab the attention of unsuspecting consumers. 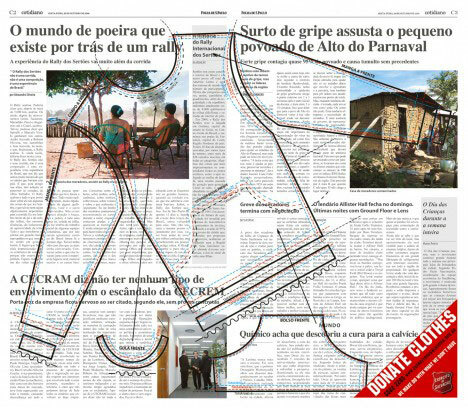 But believe it or not, these subversive and innovative ideas can be reapplied in creative ways – such as through subvertising, reverse shoplifting or other culture jamming – or can even used more directly for good causes – not just lining someone’s pockets. One of the most easily recognized social guerrilla campaigns is “Obey.” If you live in or near a major city, you’ve no doubt seen stickers like the one above. 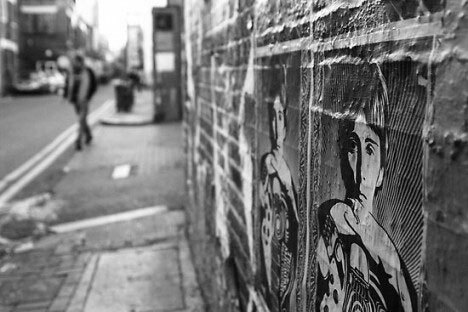 The Obey campaign is the brainchild of artist Shepard Fairey, who describes his work as “an experiment in phenomenology.” What started out as an inside joke in the skater community eventually grew to encompass the world. 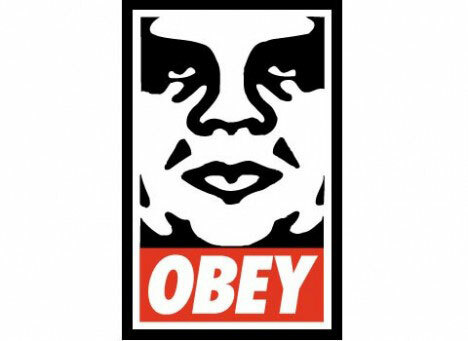 Stickers and stenciled images featuring the iconic image of Andre the Giant and the cryptic big brother-esque word “Obey” can now be found from San Francisco to Tokyo and pretty much every city between. By looking like advertisements for something obscure and exclusive, Obey images serve to make us more aware of the constant barrage of commercial ads we are subjected to each day. Somewhat ironically, the campaign has spawned a clothing line and a successful design career for Fairey. Obey now produces many images besides the giant who started it all. Guerrilla marketing has proven its versatility as a social medium and money-making advertising tool. Now, even nonprofit organizations are getting into the game. Lots of nonprofits have embraced guerrilla advertising as the perfect way to get the attention needed to further their causes. 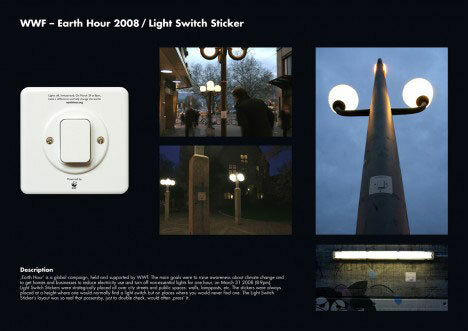 In anticipation of Lights Out for Earth Hour 2008, the WWF placed stickers resembling light switches in outdoor locations around Switzerland. The stickers looked so realistic that many passers-by actually tried to switch them off. When they were close enough, they could read the text all about the upcoming event. 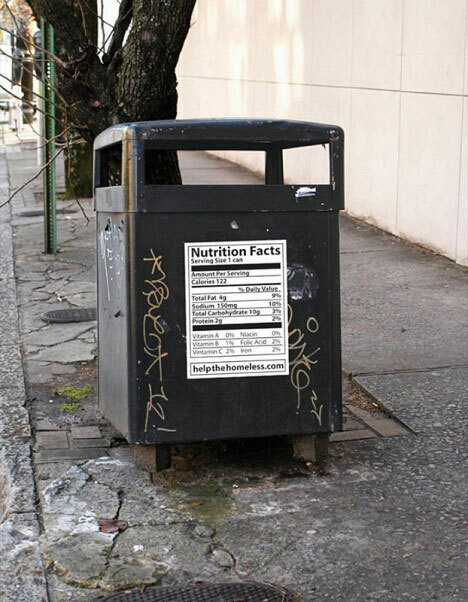 To create awareness of the plight of homeless people in America, these nutrition facts labels were placed on outdoor trash bins. The familiar image in an unexpected place causes the mind to react differently than it would to an obvious advertisement. The viewer is drawn in to examine the label and figure out what it’s doing there. The URL at the bottom gives a call to action, and the hope is that the image will stick in the viewer’s mind long enough to encourage them to follow through on that action. 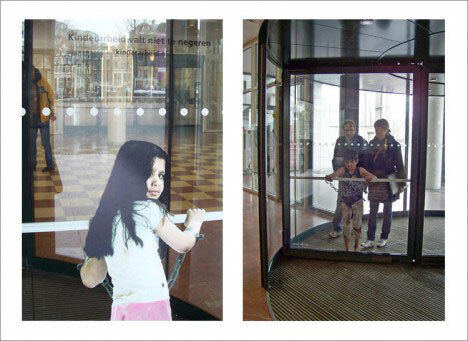 We are intrigued by juxtaposition, and that is one of the hallmarks of effective guerrilla advertisements. Seeing something that is out of place, shocking, or just plain bizarre snaps the mind out of the state of forced indifference – a state that we’ve developed in response to ever-present advertising. Because the marketers behind guerrilla ads use this knowledge to capture our attention in new and unusual ways, does that mean they’re manipulating us? In a word, yes. The goal of any advertisement is to get you to do something. 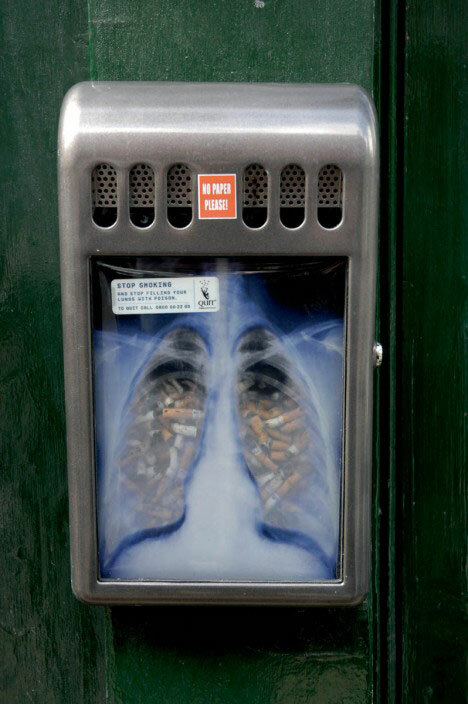 Whether that something is buying a product, seeing a movie or, as in the picture above (from a UK ashcan), stop smoking, marketers play on psychological principles to affect our behavior. The advertising world has latched on to these principles because of their incredible effectiveness. But what kind of lifespan does guerrilla marketing have? Will we eventually become desensitized to even the most shocking advertisements? According to some people, though, guerrilla marketing campaigns already go too far. While they are by nature invasive and jarring, there have been several guerrilla marketing campaigns that were overflowing with shock value. Besides some notable well-intended flops, many guerrilla marketing campaigns either fall short of the mark or overestimate our tolerance for shocking images or methods. Coming up: more details on kinds of and approaches to guerrilla marketing and ways in which guerrilla marketing might even work for you!